Four female judges were the heroes of the fight against Trump’s executive order. Activists hold placards outside the U.S. courthouse where Federal Judge Ann Donnelly issued an emergency stay on Saturday. In 2016, Donald J. Trump was elected president of the United States. In his first week in office, President Trump signed a cruel, malevolent, and plainly unconstitutional executive order that prevents refugees, migrants, and even green-card holders from seven majority-Muslim countries from entering the U.S. As a result of that order, lawful immigrants have been held at U.S. airports, in some cases without being allowed to see their lawyers. 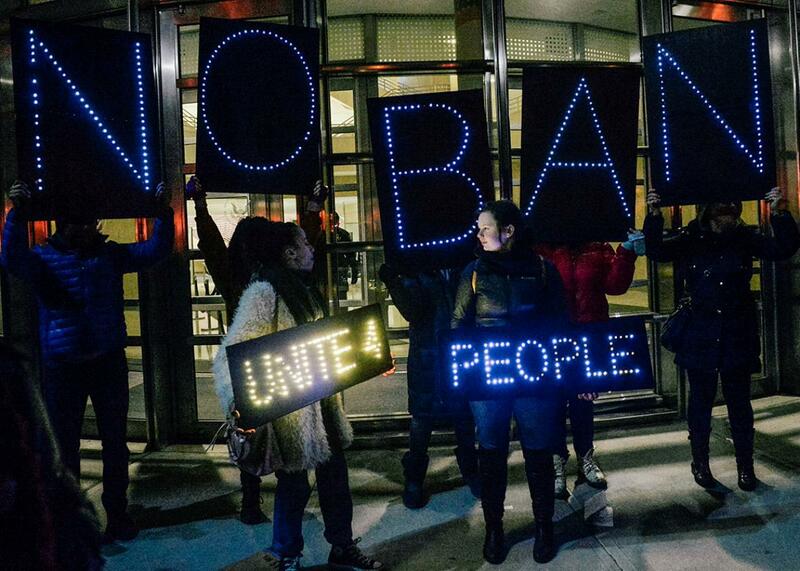 Around 9 p.m. Eastern on Saturday night, in the Eastern District of New York, Judge Ann Donnelly issued a temporary nationwide stay, blocking the government from removing the immigrants that are currently being detained at airports around the country. A few minutes later, in the Eastern District of Virginia, Judge Leonie Brinkema issued a temporary restraining order giving all permanent legal residents detained at Dulles Airport access to lawyers, and blocking the petitioners from being removed. At 1:51 a.m. Eastern, two federal judges in Boston, Judge Allison Burroughs and Magistrate Judge Judith Dein, also imposed a seven-day restraining order against Trump’s executive order. And very early Sunday morning in the Western District of Washington, U.S. District Judge Thomas Zilly issued another order stopping any deportations. For those of you scoring at home, that’s four female judges and one male judge pushing back in a 12-hour span. Those four women aren’t pushing back because of their gender. It’s hard to imagine any judge reading this executive order, which was seemingly reviewed by Lionel Hutz at a bar in Springfield, without enjoining it. But it seems wonderfully fitting, just a week after the Women’s March on Washington, that the fight against Trump will be taken up by female lawyers, advocates, and jurists, and that they’ll be fighting alongside men.